The first Marvel Legends came out in 2002. In 2015, we got a figure of Blizzard. So if anybody asks you how long it takes to get to the bottom of a barrel, the answer is "13 years." Common thug turned powerful villain, Donnie Gill paralyzes his enemies with arctic blasts! We kid Blizzard. He may not be an A-list villain, but he's not the worst thing ever. He did make it onto Agents of SHIELD, agfter all. And he's had an action figure before (1995, in Series 2 of the Iron Man cartoon tie-in line), though I guess that was technically Gregor Shapanka, the guy who was Blizzard before Donnie. Gregor got killed by Iron Man 2020, and then Justin Hammer gave his suit to the new guy. Yes, like many an Iron Man foe, this one's powers come from his clothes. Although, when the Terrigen Mists were released all over the globe, he was one of the people to gain new powers from them, which of course conveniently duplicated the powers the suit had given him. 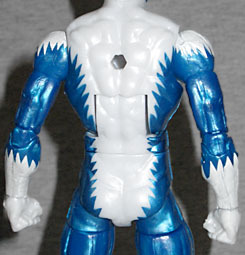 Blizard has had several different costume designs over the years, but they were all some variation of white and blue. Even when the Mandarin gave him a stupid suit of armor, it was blue and white. Some masks have been all-white, some have had goggles and an exposed face, but this one is blue with a white "hairline," for lack of a better term. 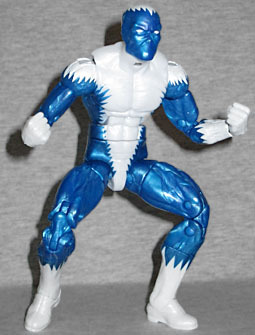 This costume is sort of a mix of his original (the blue face, the jagged white stripe that goes over his head and down the center of his torso) and the one he wore as a member of the Thunderbolts (the jagged edges on his gloves and boots point up, rather than hanging down), but it's not like anyone will care if Blizzard's costume is a "greatest hits" version, will they? Surely there's someone out there for whom Blizzard is their hands-down favorite character, but they're probably just excited to get a real figure of him, and aren't going to nitpick the outfit. Thankfully, the white of the costume is pure white - there's not attempt to paint on shadows, so he definitely looks his best. The blue is metallic, but not quite as swirly as some examples. The head is the only new part of the sculpt: below the neck, he just uses the small body, and so has all the attendant articulation. Mine was minorly misassembled, with the knees in the wrong legs - an easy enough fix. It really would have been nice if Hasbro had given him some ice blast accessories to fit over his fists. But really, there's a reason they couldn't. Blizzard is this series' cost-saver: minimal new parts, simple paint masks, etc. 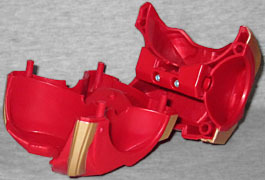 And the reason for that is he comes with two pieces of the Series 2 Hulkbuster Build-A-Figure. Well, one or two; it depends on how you want to count. He's got the BAF's upper torso, but it's divided into two halves, front and back - you have to assemble it around the lower torso, and it's so big it might not have fit into the packaging if the halves were already together. For (charitably) a C-lister, Donnie Gill is a surprisingly complex character. He's shown signs of wanting to reform his ways, though he usually gets pulled back into the life because all his friends are villains. This is not the most exciting Marvel Legend of the year (other than the fact that you can walk into a store and buy an official toy of freakin' Blizzard!) and so will be overlooked or ignored by a lot of collectors. And really, other than the BAF piece(s), that's not entirely unjustified.